"Saucon’s lead technician has been terrific in working with our team, especially when we learned he was to be on vacation! We really appreciate his above and beyond help." Our TDS solution continuously performs comprehensive checks on your vehicle safety systems including overall engine health, breaking mechanism performance, tire pressure and more. The advanced GPS tracking capabilities also provide remote insight into driver behavior, allowing you to proactively address erratic driving patterns and more. At Saucon, we work tirelessly to innovate safer roadways by preventing mechanical breakdowns and reducing human error. The TDS solution continuously performs multiple checks on vehicle safety systems including overall engine health, breaking mechanism performance, tire pressure and more. Driver performance is also under continual scrutiny, monitoring for vehicle speed, hard stops, erratic behavior and missed stops, while our ELD solution satisfies today’s Hours of Service (HOS) legislation requirements. Our influence on safety doesn’t just stop at enhanced vehicle reliability. We also provide a host of solutions that, when used appropriately, can play a huge role in enhancing safety for drivers, passengers and our community. Our GPS tracking capability provides dispatch operators with alerts when a bus is not in the correct geo-zone or is operating erratically, thus triggering precautionary actions. If someone takes over your bus, you can immediately put the bus into idle speed from your remote dispatch location to thwart any potential misuse of the vehicle. Secure start and secure idle functions take safety one step further, ensuring only your drivers have access to your buses. Our onboard video system can provide drivers and passengers with enhanced safety and peace of mind. When onboard video is mounted in your bus in a prominent location, the system can act as a deterrent to malicious activity. Since our video solution is continually recording and not just recording based on an “event”, you can review specific footage from a given date and time. For passengers, it’s important for them to stay connected with work and loved ones while on route over their mobile device. Our passenger WiFi solution provides instant communication and the ability to stay in touch with friends and family, plus the power to alert authorities of dangerous incidents happening in realtime. Our integrated Driver Vehicle Inspection Report (DVIR) and Vehicle Maintenance solutions let you manage maintenance requirements in realtime. Our solutions also provide your fleet with built-in predictive capabilities that allow you to anticipate and correct problems before they even surface. Striving for operational efficiency means keeping your vehicles running at peak performance. Managing fleet maintenance increases vehicle availability and reliability, improves general fleet safety, reduces overhead costs, and extends the longevity of your vehicles. Our integrated Driver Vehicle Inspection Report (DVIR) and Vehicle Maintenance solutions let you manage maintenance requirements in realtime. Our vehicle maintenance solution provides service record reporting and management with the ability to track costs including labor. We can customize service order definitions, automatically generate work orders and provide preventative maintenance notifications. Our robust inventory capability can automatically assign the necessary parts to a work order. Our system’s remote engine monitoring and diagnostic capabilities allow for a finely tuned and continuous analysis of vehicle health. These insights include predictive capabilities that allow you to anticipate and correct a problem before it even happens. Our solutions have made a clear and profound difference in preventing vehicle breakdowns while on route, reduced shop visits and associated costs, improved operator analysis, enhanced preventative programs, and automated data gathering and analysis. Direct SAE J1939, J1708, and ODB II engine telemetry are all powered by Saucon’s industry-leading hardware platform. Our commitment to client alignment is one of our core principals. We work non-stop daily to develop the technologies that enhance the coach customer experience with systems such as broadband-quality onboard WiFi so your riders can enjoy dependable internet access anytime, anywhere. We’re driving change across the industry. Our people. Our solutions. Your results. We are committed to continually create and deliver leading technology for a greater operating and passenger experience. Our cloud-based solutions are engineered keep your buses moving, and we excel at creating a cost-effective and efficient process you can roll out amongst your entire fleet. For over 15 years, we have innovated ways to leverage GPS capabilities and enhance the overall rider experience by allowing our clients to tell their passengers exactly when to expect an arrival. Today, our extensive traffic and vehicle tracking tools also provide insight into at-the-moment road closures and accidents, providing drivers with re-routing intelligence that allows for an adjustment to traffic realities in order to stay on schedule. In addition, our onboard WiFi systems enhance passenger comfort and connectivity, while our video surveillance solutions create rider peace of mind. Our passion to innovate is illustrated by our work in connected diagnostics, putting us at the forefront of our industry in delivering advanced technology. Through connected diagnostics we provide guidance in making informed time-critical decisions, enabling our clients to avoid unnecessary expenses and helping to keep their vehicles on the road. When fault codes are generated, they are automatically transmitted, analyzed and presented in an easy-to-understand summary report. You can then take action to avoid progressive damage and reduce expensive equipment recovery charges. In some cases, we may suggest a custom solution is best suited to fit a particular client need. Whether it is a custom implementation or new application, we pride ourselves on delivering the solution most required. We have a long history of collaborating with our customers and enter a partnership towards a common goal. This client alignment is one of our core principals in making sure we deliver the technology that best suits individual requirements. 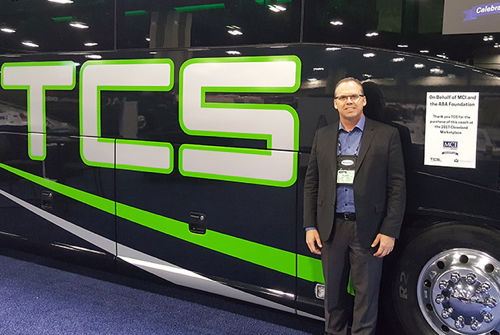 Over the past 30 years, Transportation Charter Services (TCS) has earned a reputation as a leader in the charter bus industry. Based out of Los Angeles and Orange County, TCS services communities throughout the Western US and Canada. The company is widely respected for continuously improving their skills, knowledge and ability to create exceptional customer experiences. As one North America’s industry leaders, it is essential that the TCS fleet and team members continue to lead the way. The company recognized an opportunity to strengthen their leadership position by supporting their operation with the most sophisticated software and technology platforms available. We developed a suite of advanced fleet technologies accessed through an onboard controller, to provide crucial insights into key performance metrics. The engine codes and driver report card data generated by the Saucon system have allowed TCS to evaluate driver performance, provide training and proactively implement new procedures, all while creating a safer and more efficient operating environment. As the company’s business needs evolve, our solutions have evolved in tandem to enable TCS to perpetually improve their service offering. Today, TCS continues to analyze data to help them make better decisions and enjoy exceptional ROI on the solutions we provide. Maximize your fleet’s GPS capabilities with graphical mapping, vehicle tracking, scheduling, arrival forecasting and full operational reporting. The system is fully integrated for interface with Google Earth and all associated functionality. Effortlessly manage your mobile assets. The TDS solution’s realtime resource tracking and mapping tools provide a crystal-clear picture of the past-present-future activity of every vehicle in your fleet. Utilizing a web-based interface, vehicles are tracked and monitored wirelessly to issue alerts back to dispatch in the event of speeding, scheduling issues, engine/mechanical issues and more. Claims are expensive. Our road-ready systems have reduced legal costs by over of 30% in the short term alone through a reduction in fraudulent claims. Camera systems are also proven to enhance driver safety and rider peace of mind. Powered by our industry-leading hardware platform, you’ll get accurate reporting of driver activity for full ELD/HOS compliance. The system is fully customizable to integrate seamlessly with other systems, or available as part of any total Saucon solution. Our DVIR process focuses on the operational and physical aspects of the vehicles. Drivers can complete a DVIR both pre-trip and post-trip as needed, giving operators clear insights into the reliability and costs of their fleet. Get a complete breakdown of early, late, on-time and even missed stops. The system also provides functionality that can determine when a vehicle is actually off the dispatched route. In today’s smartphone reality, offering onboard WiFi is simply another business essential. Our high-speed system is easy to install, allows 120 concurrent sessions and includes content filtering to prevent excessive use and malicious access. Our software developers and subject matter experts understand the unique needs of the industry. Together, we can develop apps for your organization that will enhance the rider experience, simplify the way you work, offer enhanced oversight of your fleet… whatever your business need.